A professional 3D artist in Atlantic Canada. Man, it keeps getting easier and easier to start a model off with the form you want. First up is Autodesk's Photofly, which generates a model using a series of photographs. Even with a cheaper point-and-click camera and less-than-ideal lighting, the result it generated still managed to surprise me. It's a complete mess of triangles of course, much like a scan, so I'm in the process of seeing how well it works when retopologized and cleaned up. Eventually I'll move on to sculpting in more detail, correcting the shape, and cleaning the lighting information out of the texture. So far so good though. ZBrush 4 Release 2 has been out for a short while now, and I'm really loving some of the new features. It's now even faster to mash a bunch of basic shapes together to get the overall form you want. This is using the same technique I mentioned a while ago, except without doing any manual retopology. Instead just pop it into zbrush, turn on dynamesh, and smooth out the joints. Before long, you're onto the fun part of sculpting. Man, your models are amazing! Great work! So, I wonder, if Photofly can extract info from a series of photographs, wouldn't it work with concept art, too, if you draw a series of 3-4 images for it to use? Or is the mess it makes to clean up simply not worth it? Hey man. I was actually hoping to do some more tests this weekend now that I have a better and faster camera. I just need to wait to get my internet back up and running (I just moved for a job). Hi Mike, I 'm the owner of a ARMA Clan that plays with Canadian Forces MODs. Unfortunitely, we have many errors in our MODs and decided to restart from scratch. As a member of the Air Force for 24 years, I would like to not insult the membership and give them the best. Are you able to help provide Models for our Technical crew so they can create our new mod pack, or do you know someone who could? Nothings going on at the moment. I was thinking of doing something Halloweenish. 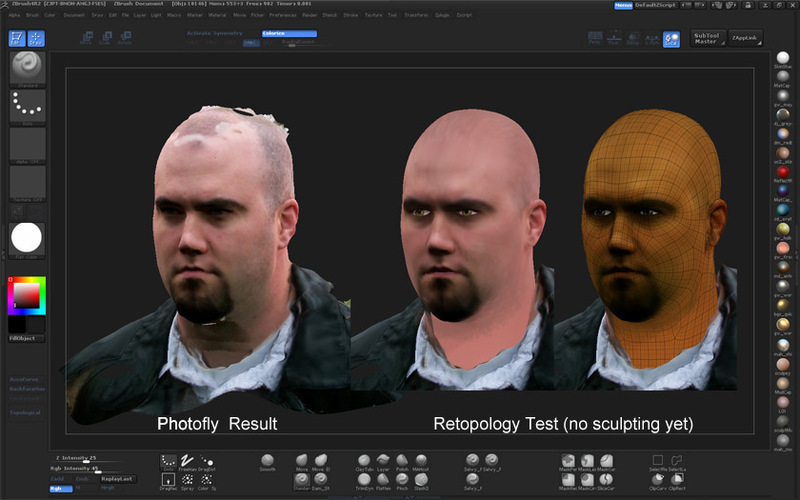 Do you know some retopologize tools for 3DS Max 9? Or retopo is for newest Max only? I think there is a 'Wrapit' plugin for Max 2009, but I'm not sure if it's free or if there are any built-in alternatives. I'm not overly familiar with Max's set of tools.